Fastest Way To Change Your Cheating Husband With Prayers. Luke 21:15 “For I will give you a mouth and wisdom, which all your adversaries shall not be able to gainsay nor resist”. Hi, friends. This is the second month of the eBook, ‘Deliverance Prayers That Win Back The Cheating Husband’, and there are already 216 Praise Reports from diverse places of the world. I have received testimonies from the United States, Canada, South Africa, India, Nigeria, Papua New Guinea, Great Britain, Jamaica, Germany, Philippines, Trinidad and Tobago, Uganda, Russian Federation, Brazil, France, Australia, Kenya, Malaysia and many others. I’m overwhelmed by the number of changed lives, changed husbands and changed marriages within the short period. The eBook solved the highly laborious process of typing out prayer points for each of you...and there are several thousand wives to answer promptly. That's why I'm able to answer your mails and counsel you speedily. For those who have been answered, please don't stop praying for your marriage and family. You may change prayer points but NEVER stop praying. Prayer is the unending habit of every Christian; it maintains the presence and power of God in your circle. The Most Important Ingredient In Prayer. John 16:24 "...Ask and you shall receive, that your joy may be full". The most important part of prayer is the receiving!. Prayer is asking something from God…and receiving it! That’s Jesus kind of prayer (Matthew 7:8). Your receiving may be instantaneous, or take a while. If you are going to wait before you receive, you would know by divine assurance. If you receive nothing at all, or get what you don’t want (which you did not ask for, of course), then something is really wrong. If your husband is changing little by little, or in stages, it's a boost to continue praying. But it's frustrating for wives to pray on and on and no change from the cheating and lying husband. That's not the will of God for you. Since God do not change, it means the barrier to the prayers is on your side. So we continually need to examine ourselves as we pray (2 Corinthians 13:5). The fastest way to get your prayers answered is to follow the steps of those who have prayed your type of need in prayer. The challenge is that you may not easily find that category of people, or they may not be willing to share and help others with their experience. I believe that’s why God brought you my way. I have been privileged to play a huge part for thousands of wives in turn around prayers for their cheating and lying husbands. I’m involved in cooking (preparation) of the prayers and serving (praying) them! And I have seen all manner of immorally ‘lost’ men changed to decent family men. Your Relationship With God Gives You An Edge In Prayer. The first person to examine and correct when prayer is not changing anything is your relationship with God! That should make you curious. God may be so many things to you but if he's not your father you’ll be utterly limited in prayer. God desires to father you, to love you as His daughter. Imagine if you heard two distressed voices in the wee hours of the night calling for help from down your street. You may not be that bothered until recognize one of the voices was your daughter’s who had gone out earlier. Would it be a good guess if i say you would be out there to help her before you could think? Your motive would be to save your daughter first before the other girl. “…let the children first be filled…”(Mark 7:27). Getting The Prayers To Work For You. If you keep the relationship element, the other part is an easy walk. I assume that you already have the prayer points. 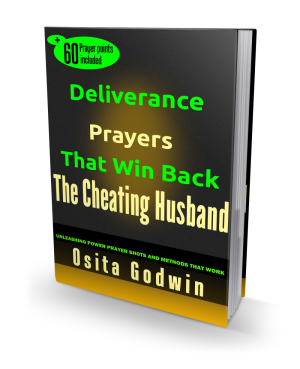 Today's post was aroused by the many who sought how to pray the 77 prayer points already released in the eBook ‘Deliverance Prayers That Win Back The Cheating Husband’. If you don’t have the eBook download your copy now at http://bit.ly/1dsRKD7. The first thing you’ll understand is that every prayer point is a guide to help you focus on the direction of prayer. I repeat, the scripture and the prayer help you to know what God wants you to ask (and expect) on that issue. This is to prevent wandering or rambling in prayer, which gets you nowhere fast. However, if you stick to that prayer point in your hands, up to a minimum of 14 (maximum 21) days, praying day and night, you’ll have sucked in, and released, the powers in that prayer bullet. And then you must see your answers...or some of them. I also suggest a maximum of three prayer points per session, a session being a prayer stretch of about 14 to 21 days. Don’t be tempted to abandon a session or part of it because of changing circumstances. That’s always the ploy of the enemy to make you change a winning set. If you feel strongly the need to adjust your prayer session, you may contact me for counsel. When you pray, use any language (it's ok to be emotional) to communicate your prayer point. Remember, in prayer there’s Somebody at the other end. You should be desperate in prayers because a thirsty soul is always satisfied (Isaiah 44: 3). Prayers don’t have to be unnecessarily long but it should not be summarized either. Stay on it until you feel a release. If you need to repeat the same things all over to get your release, do so (Mark 14: 39). The release I mean here is the assurance or peace when you pray through. Usually, there is an inner peace or satisfaction that you’ve done your bit well. Once you are there, relax. The manifestation will follow. One other point, though, the feeling of assurance does NOT mean you should stop further praying. You’ll continue until the end of your remaining praying session days or full manifestation of your request. Remember, I'm available to pray along with you, answer your questions and guide you to end the pain and shame of your cheating husband. I appreciate some of you who have reached out financially to us in the past one month to sow seeds into this ministry. As you support what’s going on here, our God will also see your innermost needs and send you timely support. God will reward you and your seeds of love shall never be in vain. This Prayer Project is completely free for any one we pray with or counsel. We have never asked anybody money for the prayers but we welcome the financial support of anyone who has been blessed in any way by this ministry. Surely, the prayers have been a blessing to so many women beyond what money can get. The Prayer Project is full-time and intensive but supported by people who believe in the work and are moved by the Holy Spirit to reach out to us. Now, our numbers are really rising and the work load is enormous. I need you to support this divine Project by sending us your financial seed. Please do this if you are led by the Spirit, otherwise there is no obligation. If you are led to reach out to us, send me a mail and I will inform you how you may send your seed of love. God will surely reward you.